Acure is a brand we’ve written about boatloads. You’ll find their products in our purses, on our desks, in our bathrooms, in our showers. We even had the chance to interview (and fan girl over) Amy Halman, Acure’s president, for Unsullied! …so, y’know, we’re kinda fans. Much to our delight, Acure has had a bunch of product launches this year. We wanted to share our faves with you, because we’ve been using some of these products on the daily. Drum roll, please: Acure’s most recent release is also their most exciting of the year (I think). 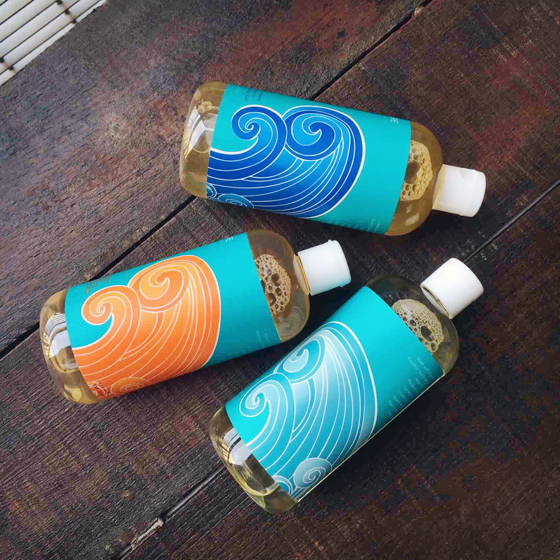 These aromatherapeutic argan oils ($12.99 for 1 oz) seriously transport me to a calming place. Coming in Rose, Citrus Ginger and Coconut, you can apply 3-4 drops after your moisturizer or AS your moisturizer on your face, neck and eye area. 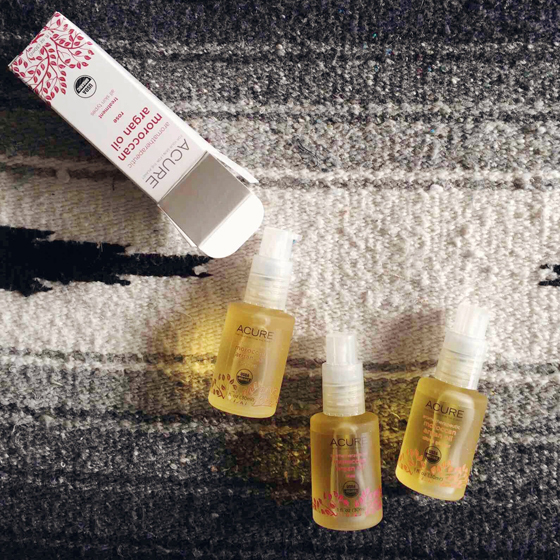 Or, if you’re like us, you’ll find uses for argan oil all over your body – your hands, cuticles, elbows, etc. These are nice little bottles to keep on your bedside table or at your desk when fall/winter dryness sets in. Plus, depending on your scent preference, you’ll get to bask in relaxation (rose), tropical vibes (coconut) or energizing citrus. 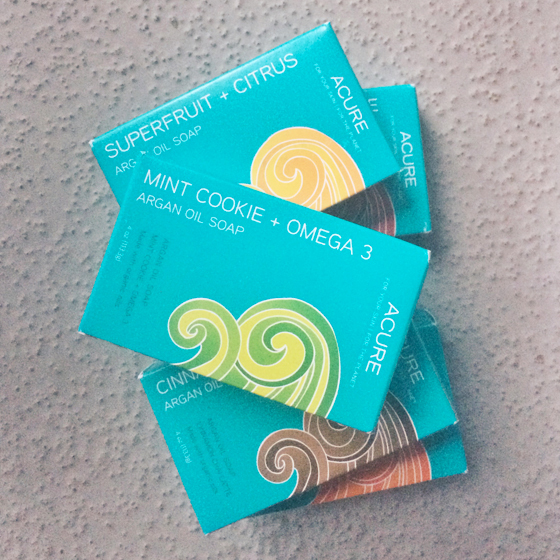 The new Acure Argan Oil Bar Soaps ($5.99 for 4 oz.) come in five flavors…er…scents…and generous portions of super good-for-you ingredients. The fun Mint Cookie + Omega 7 is an obvious favorite for mint chocolate chip ice cream-loving Kathryne! Exfoliating, too! Enriched with their signature argan oil, the soaps last a really long time and are bigger than your average artisan soap. Pumpkin + Calendula, Oatmeal + Apple Pie, Superfruit + Citrus, and Cinnamon Chai Latte round out the festive bar soaps, which are ideal for winter weather with their nourishing ingredients including sunflower, argan, and coconut oils. I see stocking stuffer written all over these (spoiler alert). If you’ve seen the inside of my purse, you know that I go a *leeettle* overboard on the amount of lip glosses, stains, sticks and balms I tote around. GUILTY AS CHARGED. 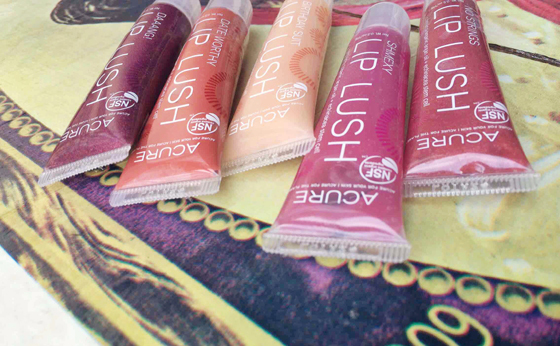 Well, Acure’s affordable, awesome and completely unsticky Lip Lushes ($7.99 for .5 oz) are now a staple of my rotation . Birthday Suit, Shmexy and No Strings (God, those names…) are all very sheer. Date Worthy is a perfect everyday color: it’s an opaque, brick red that amps up the color of my natural lips just enough. And, hot damn, I’ve been wearing the darkest shade, Daaang! like a fiend this fall, and it’s especially good layered over a red or burgundy lipstick. It really does incite that “Daaang!” reaction with its rich color and shimmer. You gonna look good, girl. And as a last programming note…Acure also released their line of castile soaps this summer, which have been wonders to have around the house. Like any castile soap, they’re multipurpose. Kathryne uses them to wash her kitties (eeee!) and I have the citrus in the kitchen for dishwashing and the peppermint in my bathroom for hand washing. They’re on sale now, too, until December: a $9.99 bottle is only $6.99. A steal considering how long a 16 oz. bottle will last you! **All Acure products were generously sent to us for review by the product manufacturer. Check out our policy on product reviews. What Acure products have you been usin’ lately? Next Article Are you a skin care herbivore? We love the bar soaps! The scents can seriously not be beat. You will want to eat them! Haha! Acure Organics was one of the first brands I tried making the switch and I absolutely adore all the products I’ve tried. Would love to sample more from them though, great review! 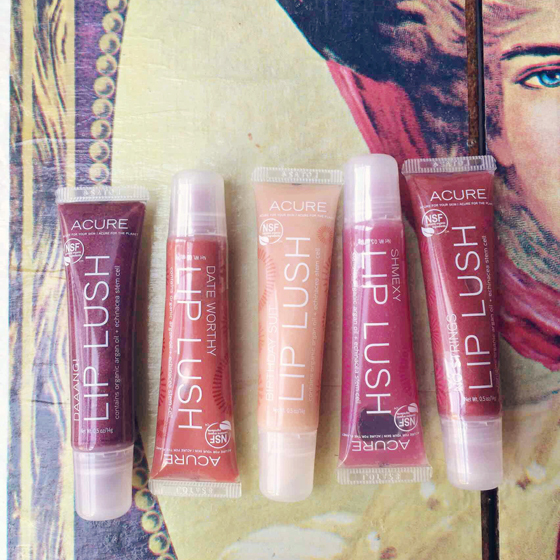 I feel an iHerb order coming on…I’ve missed Acure in my life! Yes! Love how you can pack in all your supplements/snacks/beauty products into one order on iHerb.